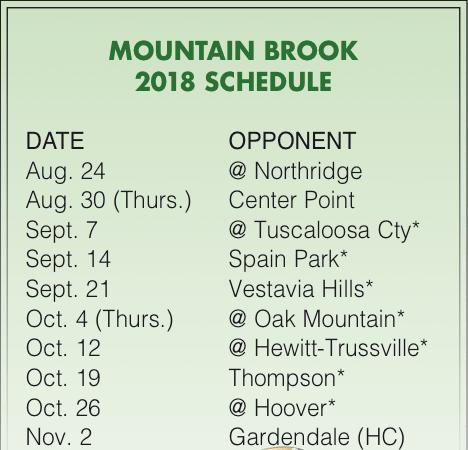 Members of the 2018 Mountain Brook High School varsity football team include: Hamp Greene, Duncan Bicksler, Alex Washington, Logan Brewer, Brendan Brogan, Edward Cain, AJ Gates, Daniel Wilbanks, Crawford Golden, Pierce Rodrigues, Bennett Johnston, Atkins Roberts, Strother Gibbs, Aidan Hood, Jackson Tew, Robert Reed, Ben Savage, James Burkett, Blake Roth, William Miller, Huston Crommelin, Jay Rucker, Sam Higgins, William O’Leary, Baynes Autrey, Grant Griffin, Will Yarbro, Will Baynes, Edward Reed, John Decker, Blake Pugh, James Nichols, Michael Brogan, Jack Walters, Collin Bussman, Paul McMinn, Kamp McMinn, John McKimmon, Rhyne Hogue, Mark Smith, Clark Griffin, Calvin Wilbanks, Matthew Holloway, Jarret Harrison, Colton Yeager, Alden Chaney, Reid Manley, James Hufhmam, Pearson Bedingfield, Hugh Lawson Joy, Michael Mancuso, Colledge Elliott, Chip Porter, Charles Regan, Jacob Lucas, Drew Elliott, Braxton Wetzler, Will Grant, Charles Law Schilleci, Beau Hubbard, Rob Gunn, Trey Gory, Hayden McDonald, Grayson Chew, Andrew Fleming, Jackson Allison, Sam Somerville, Austin Sikora, Ryan Kampakis, Henry Skinner, Alex Stokes, Ian Hall, Braden Allemand, Will Christopher, Ford Kelly, Eli Pappas, Miles Waldrop, Boyd McWhorter, Colten Niemann, Paulson Wright, Corbin Peterson, Zach Bass, Jay Barze, Turner Welsh, Gavin Lee, Matthew Gray, Mason Brint, Wheeler Bowron, Jack Smith, Preston Horsley, Win Horn, Cade Holmes and Campbell Pickard. Photo by Hank Spencer. 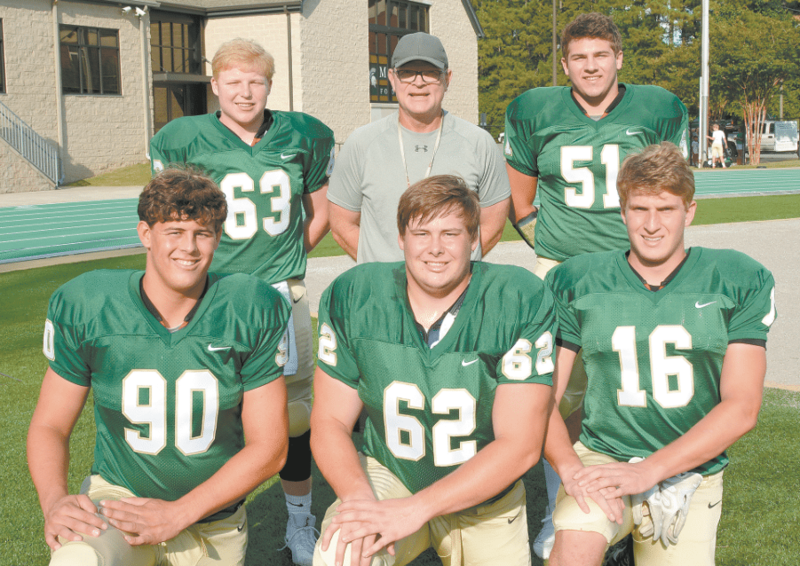 Defense will be a strength for Mountain Brook in 2018. Coming off an 8-4 season that concluded with a loss to Thompson in the second round of the state playoffs, the Spartans return nine players from a unit that lost just two 7A Region 3 regular season games. That line will be anchored by seniors Michael Mancuso at tackle and Hayden McDonald at guard. But the other spots are up for grabs. Hugh Lawson Joy, Beau Hubbard, Chip Porter, Braxton Wetzler, Will Christopher, Braden Allemand and Sam Somerville have spent spring and summer working to fill those other positions. The team also will be looking to replace two important pieces of the backfield in departing quarterback Hamp Sisson and departing running back Harold Joiner. Sophomore Strother Gibbs and junior Bennet Johnston will each get a shot at quarterback, while seniors A.J. Gates and Daniel Wilbanks hope to fill Joiner’s very large shoes. Joiner is now at Auburn. There’s some experience at wide receiver in senior Hamp Greene. He’ll be complemented by Blake Roth, Pierce Rodrigues, Jay Rucker, Eli Pappas and Paulson Wright. While some new faces will see more time on the field this season – especially on the offensive side of the ball – a bounty of experience helps make that transition much easier. The 2018 Spartan squad boasts 35 seniors. But Yeager doesn’t hold each team to the standard of the team before it. When competing in a region as difficult as what the Spartans face each season, he said, the priority is focusing on themselves and what they know that they can control. He said that improving on last year’s 8-4 mark can’t be the focus for the team. Spartan key players with Mountain Brook head coach Chris Yeager front, from left: Gavin Lee, Trey Gory and James Burkett. Back, Hayden McDonald and Michael Mancuso. Journal photo by Jordan Wald. “It comes down to day-to-day work ethic. I’ve made that mistake in the past. You’ve got to set goals to match you. Your focus has to be developing yourself each day to maximize your own potential,” Yeager said. 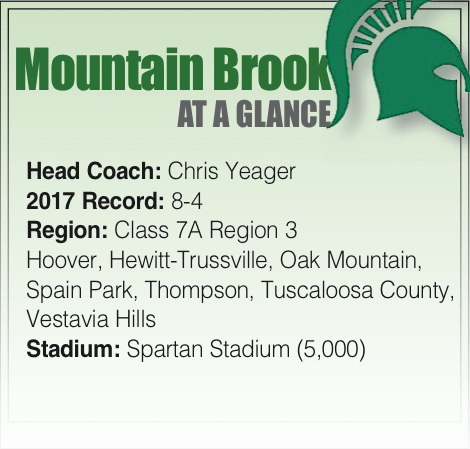 Obviously, the Spartans will face stiff competition within their region, which includes Hoover, Spain Park, Vestavia Hills, Oak Mountain, Hewitt-Trussville, Thompson and Tuscaloosa County. They’ll also travel to Northridge and host Center Point and Gardendale in out-of-region play. The team’s opener is Aug. 24 against Northridge, which Yeager expects to be a tough test. 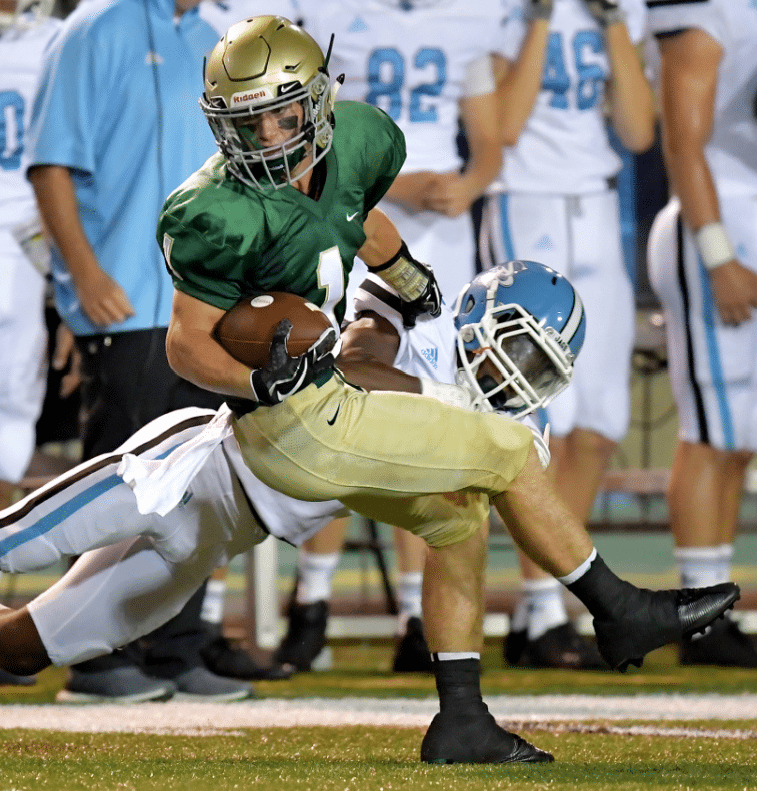 High school teams have 11 weeks to play 10 games. Many opt for a jamboree in the first week, but the Spartans will opt for a mid-season bye week. They’ll likely need the rest on Sept. 28, as they work their way through that familiar gauntlet. Diving headfirst into a difficult opponent is something Yeager believes ultimately will help his team learn more about themselves as they move forward.